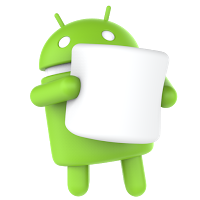 Google has made it a thing to name its Android OS versions after food. Letter by letter in the alphabet (har har). But not just any food — food that’s really bad for you. This version, which has been called “M” until now, had its name unveiled today…. The new “marshmallow” statue was unveiled today on Google’s campus in Mountain View. If you remember, KitKat got kind of weird when Google started doing cross promotion with the candy company. Maybe there could be a Ghostbusters tie-in this time? This means that the final version of “M” is in preview and almost ready to be rolled out to consumers. No timetable yet, though.